Maybe this post should have been titled “How sauropods breathed, ate, and farted”. Or maybe not. But breathing, eating and fermenting the food will play an important role. Last week held a special pleasure for me. I spent it in New York, digitizing sauropods bones in the American Museum of Natural History’s Big Bone Room. Treasure trove that this room is, the museum still held something even better: the opening of a new special exhibit titled The World’s Largest Dinosaurs. While all such exhibits are of general interest to me, this one is special. Mark Norell, famous palaeontologist and curator at the AMNH, had a co-curator for this exhibit, Martin Sander of Bonn University, who is the head and speaker of the German Research Foundation Research Unit FOR 533 “Sauropod Biology”. As a member of FOR 533, and having received funding for both my PhD work and my first post-doc project, I am obviously somewhat biased, so please take this into account when you read this report. The exhibition does not show a large amount of sauropods material. Not that it wouldn’t make for a nice exhibit, as the AMNH’s Hall of Saurischian Dinosaurs doesn’t really have that many sauropods (one Apatosaurus mount, to be exact, with a mashed up Barosaurus vertebral column half-hidden away and a wonderful but obviously depressed “prosauropod”, my old friend Plateosaurus, thrown in to make up a bit for the many, many stinkin’ theropod specimens). But instead of showcasing some of the usually hidden-away bones of the AMNH collection (and believe me, there is some wonderful stuff there), it rather focuses on those parts of the animal that are usually missing: the soft tissues. “How did sauropods get so big?”, or, reversing the question: “Why did and does no other group of terrestrial vertebrates reach such gigantic body sizes?” These were the questions our research group has been busily investigating for the last six years, and the answers to these question are what the exhibit now tries to communicate to the public. And it does so quite successfully! 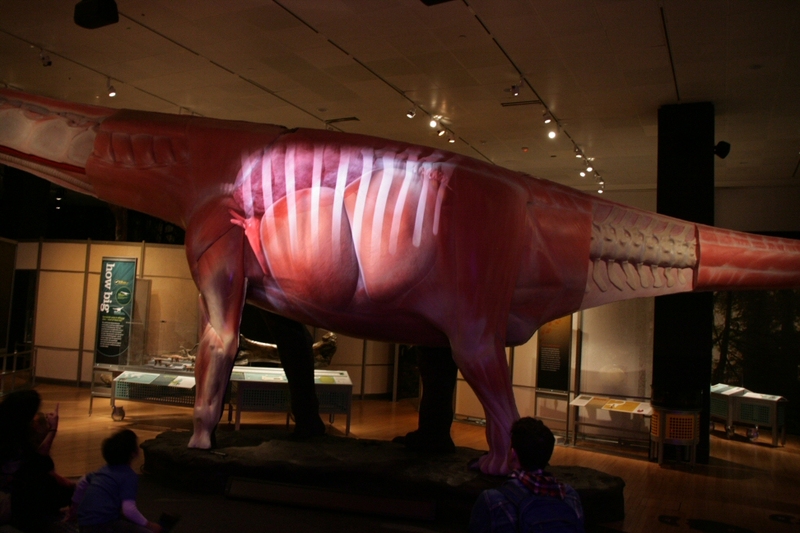 The centerpiece of the AMNH exhibit: the belly of Mama Mamenchisaurus. The centrepiece is a full-sized, fleshed out model of a sauropod (Mamenchisaurus hochuanensis), but on one side the skin and superficial musculature has been cut away. The visitor can see the neck vertebrae, the trachea, the carotid artery, and the ribcage. And the ribcage is also a projection area, on which a video is played that shows the internal organs and how they work. With a voice-over that explains the actions in simple terms, the principle of the avian-style unidirectional lung and the air sacs is explained (albeit with a small error, as lung physiologist and FOR 533 member Steve Perry was quick to point out – the AMNH has promised to fix things), as well as the basic principles of sauropod reproduction (high number of offspring). Many things are not said or shown here, which is a good thing as it allows for the normal short attention span of the average museum visitor for one piece of exhibit. Instead, interesting stuff like how much fodder a sauropod needed per day (or even per hour), a comparison of a sauropod’s and an elephant’s heart, and of a giraffe’s and a sauropod’s neck vertebra (wow, how light the sauropod one is!) are explored at small science stations spread around the room. I won’t go into a detailed description here, you can find that elsewhere on the web. The AMNH did a blogger’s preview a while ago, and invited the press for a press conference and walk-through of the exhibit with the chance to interview the scientists present on Wednesday, so much info has already been plastered all over the web. Instead, I’ll just show you some pics and talk a bit about the concept of the exhibition, and how various issues were handled that can make or break a show. One thing is how to catch the attention of visitors and direct it to the content of the exhibit. You don’t want people just going “aw, sh*t! That is one HUGE bone/animal!” and wandering off into the next room. If you want to educate them (and that, may I remind you, is the central purpose of a museum exhibit), you need to get them interested in stuff. Get them to read texts, look at stuff (not just let their eyes wander across it for a few seconds), try to get their brains going. The sauropod exhibit manages this by, first of all, being behind a closed door you can’t see through. Usually, the AMNH halls are accessible either through an open doorway, or in a few cases through glass doors. Secondly, the exhibit, especially the rather confined area you enter first, is dark. Very dark. Again a marked contrast to the AMNH’s usually well-lit halls. Just a few plants greet the visitor, and it takes a second to adjust to the dark – enough time to look around a bit and notice the neck and head of Argentinosaurus (fleshed out model) above. My esteemed colleague Vivian Allen from Royal Veterinary College London going "Aw, sh*t! That is one HUGE sauropod!" Next, the visitor is channeled along, with only a very few specimens to catch his attention. Well done, because these few pieces (sauropod leg, Komodo dragon skeleton, human skeleton, etc.) focus on getting the main message across (sauropods = way larger than everything else), aided by the largest animals (or their silhouettes) or various groups painted on the wall. Only once the message has been driven home, as I could detect from the comments I overheard, are the visitors released into the main area that contains the sauropod model and the various detail exhibits around it. The next thing is giving people time to check things out. If you herd them too much, they will get driven along by the masses. That’s why the larger, opener area around the sauropod model and the smaller bits around it works so well: people can sit down to see the projected videos on the sauropod belly, or they can drift around from one specimen or science station to the next. The stations are not just glass cabinets with some bones in them. Instead, at many of them you can DO things. One allows you to measure either an adult or baby sauropod femur or your own, and then calculate how heavy a sauropod of that size was. At another you can pump a sauropod’s and an elephant’s lung. One I liked very much simply had an unpainted sauropod model, and two sets each (adult and children height) of oculars. One showed a colorful “show-off” version, the other a “camouflage” one. “Which one is true? We don’t know!” is how I’d paraphrase the text that goes with it. 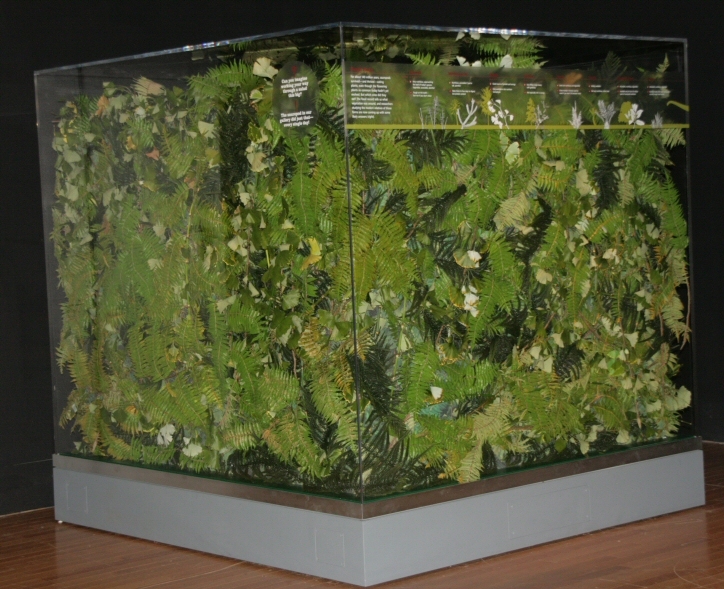 One that innocently hides in the corner is among the most impressive: a 5 ½ ft cube (1.7 m, for the civilized) made from Plexiglas filled with sauropod food. A serving sufficient for one day! On it, also, the various plant groups available in the Mesozoic were rated for various factors, getting an easily understood rating in stars. That’s another big thing: make things easily understandable, visualize them! Yummy! 100% Recommended Daily Value for your average sauropod. With all these things well done, there remains only one more thing: make things fun for kids! 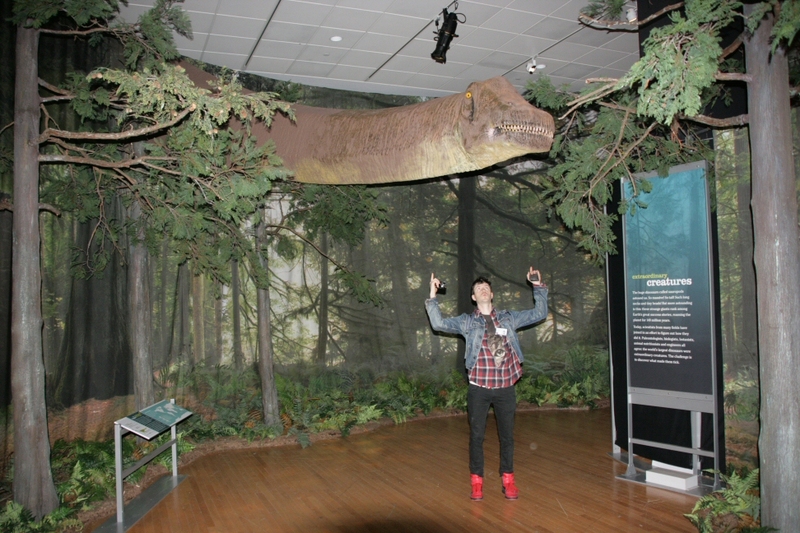 And the AMNH did just that by adding a kids’ dinosaur dig. OK, it is one of those cheesy things where you use brushes and stuff to brush sand off fossils (cast), but it was done well enough that kids lined up like there was no tomorrow. Overall, the exhibit gets two big thumbs up from me. If you make it to NY while it is on, or to any of its future stations, go see it! However, as FOR 533 member Steve Perry was quick to point out: if you’re in it only for the size, you’ll be disappointed! Aside from a few isolated bones, not much of the largest dinosaurs (Argentinosaurus and Amphicoelias) is to be seen in bone. It is the biological details that matter! But don’t get me started about the tail musculature, especially the caudofemoralis, of the big model. And then, there is the other thing about it that is closely tied to shameless self-promotion: the AMNH did not produce a catalogue or anything similar. Instead, the latest book from the “Life of the Past” series (Editor: James Farlow) of Indiana University Press was presented at the press conference. The lucky reporters all even got a free copy! The title is Biology of the Sauropod Dinosaurs: Understanding the Life of Giants, edited by N. Klein, K. Remes, C. T. Gee and P. M. Sander. And by now, I am sure, you have figured out who the authors are … It is intended to be a summary of the research findings of the first (and part of the second) funding period of FOR 533, and yours truly has two chapters in it. The first doesn’t really give much new information; most is already contained in my two papers here and here. The second, however, presents novel research that didn’t make it into the AMNH exhibit. But hey, why spoil the surprise – go and buy our book!) Overall, it is quite a technical book, so laypeople beware, but we did try to make the research as accessible as possible while retaining a high standard. For the even more technically minded there is the summary of our research group’s work (which cost the DFG ~€6.000.000) to be found in Sander et al. 2010. However, reading that paper is not half as much fun as the book, or the exhibit. Hi, it looks like you’ve got an illegal character in the caption of the first image: the apostrophe in “Mamenchisaurus’s” has got clobbered. This is preventing Firefox from reading the blog’s RSS feed. Can’t wait to see the book… and more photos of the exhibit (hint, hint). I saw the exhibit over the weekend and I agree that the presentation is remarkably well done. In particular, the lack of skeletal mounts (or very many fossil specimens at all) is very interesting. In a typical museum display on dinosaurs, the curtain is raised on the impressive mounts, everybody oohs and ahhs, and that is all most/many visitors get out of it. People leave (and probably came in with) the impression that paleontologists are people who dig up dinosaur bones and then put them on display. This exhibit, however, provides an example of what vertebrate paleontologists do after they dig up bones. It clearly lays out a specific question in paleobiology, and then shows a number of different ways to answer it. I’ll be very interested to see how this exhibit plays with museum-goers in the coming months, because it really does buck the standard centerpiece of displays on dinosaurs and provides a more accurate presentation of what paleontologists actually do. Thanks, Ben, I edited the caption. Great post! I was chuckling throughout. That “Aw sh*t!” line is going to be my new museum go-to expression for gigantism in dinosaurs. My copy of the book is (supposedly) in the mail. I worry that I already have some of the papers in, you know, paper form. Or is it all brand-new material? Either way, it was 60% off so I’m not too worried. Given the USPS’ record of getting things to me when they say they will, the book should arrive on my doorstep by November (I’m not bitter!). Zach, the book started out as a laypeople-friendly summary of the FOR 533’s first funding period. Thus, there was to be a lot of old content to be in it. Somehow, the thing kept changing on us, and it ended up quite technical, and contains a lot of novel content. Often, the basic ideas are well-known (AHEM!) by now, for those who have read Sander et al. 2010 and other stuff, but lots of details that were omitted from that paper (and others) can be found in the book. So it is worth buying even if you get some 25% of “old” stuff, by my very rough guestimate (my copy is not yet here, and I have not read all chapters). This exhibit looks stunning. Too bad I’m nowhere close enough to pay a visit. Do you have a link to Steve Perry’s comments on the exhibit, especially with reference to respiration and size? As an explainer at the show,I am especially interested. Thanks. Steve already talked to the person who set up the animation (sorry, forgot the name, great guy though! ), and this guy said he had WANTED to do what Steve was right. He also quickly got permission from the AMNH (Mark Norell, I guess) to alter the video to show respiration correctly. So expect to see a minor change soon – I hope you and the other explainers will be trained on this, too! I can’t remember off the top of my head what the inaccuracy was; something to do with how the air moves in and out and through the ventilator part. In the video it takes a wrong path. But as I said: it will soon be fixed! CAn anybody make a video for those who haven’t had the opportunity to see it? I’m very interested!